The products bought at the event are not exchangeable. According to the report from the Korea Tourism Board, the big-scale tourism promotion drama ‘HARU: An Unforgettable Day in Korea’ paid Dong Bang Shin Ki’s UKnow YunHo and Big Bang 100 million won each, and 50 million won for actress Lee DaHae. As for Kim Bum, Han ChaeYoung and Park SiHoo, each received 40 million. The total cost for casting is 370 million won and the whole production is 5100 million won all in all. ‘Haru’, the drama created for a Hallyu advertisement campaign, released still cuts of U-Know Yunho in action. The filming occurred on August 17th at Shinhangman, Busan and the released photos show U-Know Yunho performing all the stunts himself as he plays an action star in the drama. ‘Haru’ is produced by Korea Tourist Service, Inc. and Cheil Communications and is an interactive omnibus drama starring Hallyu stars such as U-Know Yunho, Han Chae Young, Big Bang, Kim Bum, Lee Da Hae and Park Shi hoo. The drama was filmed all across the nation such as Busan, Gokseong, Yangpyung, the Han River and on board the Haerang train in order to shed light onto the hidden beauties of Korea. The teaser video for ‘Haru’ was released on the official website (http://www.haru2010.com ) on the 11th and was praised for its charming cast and sensual blend of audio and video. The complete version of ‘Haru’ will be released on the 24th. After BoA, it’s the time for U-Know Yunho and Choikang Changmin to take over the stage. Prior to their first appearance, the audience were surprised with the dim of lights and silence on stage for around 3 minutes. Then slowly U-Know Yunho and Choikang Changmin appeared by holding on a wire, sliding from about 50-100 meters height of 3rd floor to the stage, the cheer of fans and light sticks soon emerged out of the darkness. U-Know Yunho and Choikang Changmin started their performance with medley of TVXQ debut hits. In this stage, Kyuhyun, Jonghyun, YeSung, and ONew appeared as special guests. The following performance was new song that is especially prepared for SMTOWN LIVE entitled “Maximum”. The two people showed off strong and powerful dance performance throughout. 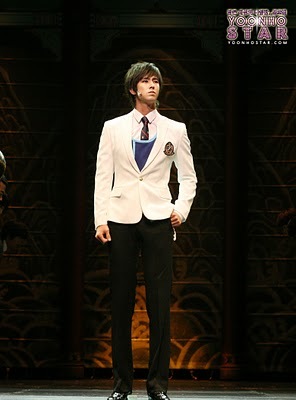 After finishing their performance, U-Know Yunho said, “Do you all wait for so long? Thank you for all fans who have been waiting for us. It’s been a while since we stand on stage so it feels so nice. Since it’s been a long time, we wanted to surprise you so this event (using wire to enter the stage) was prepared.” and “Watch over us to see how ‘TVXQ’ will become in the future. We keep asking for your unchanging love.” fans responded with a loud cheer. Choikang Changmin as well, “I would like to thank all fans for your endless love and interests. Until now we are still ‘TVXQ’” and “I’m going to work hard. So please continue to watch over us.” he said reflecting his affection to the group and received warm applause. After Stevie Wonder wowed fans with his popular tunes, powerful vocals and unforgettable stage presence, local K-pop groups are following suit with a festival to keep the musical wave high and flowing. SM Entertainment, one of the main agencies here, responsible for some of the most popular stars including BoA and Girls’ Generation, is holding SM TOWN LIVE ’10 World Tour in Seoul beginning on Aug. 21. Staged at the main stadium of Sport Complex, Seoul the six-hour event boasts a lineup of the cream of the crop. BoA, who has recently returned to the local K-pop scene with her new number “Hurricane Venus,’’ will aim to dazzle fans with her talented vocals and dance moves. The 23-year-old singer has proven her star power in Korea and Japan. Despite not doing as well as she had hoped in the United States in 2009, she is still a fan favorite thanks to her charisma and considerable experience as a top singer despite her young age. Fellow singer Kang Ta, and also an older performer in the SM stable, will join BoA to impress fans with his balladic tunes. The 30-year-old has been busy performing in Japan and China and he is returning home to greet local fans. SM Entertainment was one of the first to produce large groups, starting with the now disbanded band H.O.T, and mega groups such as the nine-member Girls’ Generation and 13–member Super Junior. They will be on hand to join their seniors on stage. SHINee and f(x), relatively younger artists, are also expected to blow the crowd away with their funky tunes and enviable dance routines. Other special highlights include a pairing of U-Know and Maxx from TVXQ, while BoA will perform a duet with SHINee’s Key. Super Junior’s Kyu-heon and Seo-hyun from Girls’ Generation will get together for a special sequence, while sisters Jessica from Girls’ Generation and Krystal from f(x) will also collaborate and show off some sisterly love and talent. With more than 80 songs on the program for the concert, fans will also get to watch actors under the SM label relax and show their playful sides at the event. Actors Kim Min-jong, Ara and Lee Yeon-hee will appear on stage alongside the singers, promising a day of sound, excitement and entertainment. The concert will continue to Los Angeles, Tokyo and Shanghai throughout the year. The SM TOWN LOVE ’10 World Tour in Seoul will be held on Aug. 21 at the main stadium, Sports Complex, Seoul. All tickets cost 88,000 won. For more information, visit www.gmarket.com. For fans looking for a more interactive performance, attend the Brand New Concert featuring top pop groups on Aug. 20. Without the loyal, cheering fans in the audience, there would be no purpose for a big performance, and this concert has been arranged as a two-way concert for both the audience and performers. Spectators will not only get to watch their favorites stars including 2AM, B2ST, Brown Eyed Girls and KARA but they will also be given the chance to show their appreciation and devotion to the singers at the event. Instead of the usual concert format where the singers perform and the fans cheer them on, concert organizers have explained that it will be a more interactive show where everyone gets to participate. As a meaningful goal for the event, organizers also announced that the proceeds will be donated to patients suffering from cancer. 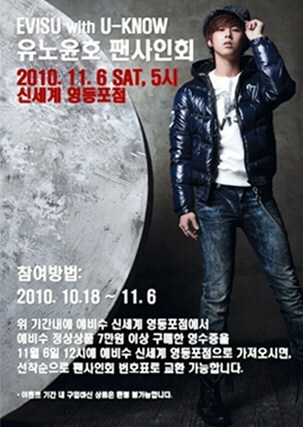 TVXQ’s U-Know Yunho has transformed into a solitary autumn guy. 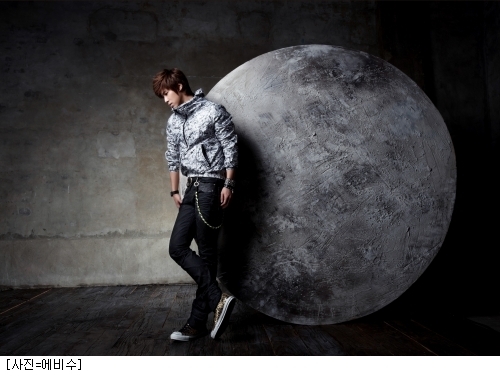 On July 15th, U-Know Yunho showed up at a studio in Seoul for a photoshoot for unique jean brand ‘Evisu’. model Kim Mi Jung back once more as Evisu’s models. This Evisu ad has an ‘eclipse sensation’ concept with the moon, with its mysterious and Eastern energy, as the motif. The advertisement is sensual and energetic with Evisu’s unique orientalism and luxurious trendy style. he was instrumental in creating a luxurious and complete scene.